For the last 22 years, a modest project has been collecting silver coins for the exclusive use of the Third Temple but according to a Biblical commandment, this annual gift is incumbent upon every Jewish male. The potential market for these coins is in the hundreds of millions of dollars. Reuven Prager makes his living as a tailor in Jerusalem creating a unique line of what he describes as Biblical clothing. In addition, he has several other projects, all geared toward bringing about the Third Temple. 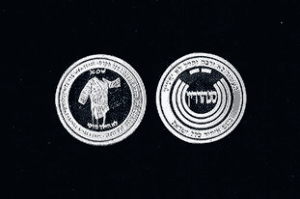 Every year at this time for the last 22 years, Prager has minted a uniquely designed silver half-shekel, for Jews to perform the Biblically mandated commandment in its proper season. Before re-establishing the Biblical commandment, Prager thoroughly researched the subject and also acquired weights, archaeological artifacts from the Temple era. The Bible commands every Jewish male above the age of 20 to bring a half-shekel weight of silver (a little over seven grams) to the Temple. Regardless of status or wealth, the same amount was given by each man. Since it is forbidden by Torah law to actually count Jews, counting the coins took place of a national census. The half-shekels that were collected were used as a form of tax to support the Jewish Temple. Purchasing the coin does not constitute the performance of the commandment. The coin must be given to the Temple or its representatives. There can be no affiliation between those selling the coin and those collecting them. In the case of Prager’s coins, the collection is handled by a special organization established for this purpose, the Otzar Hamikdash (Treasury of the Holy Temple). Once the coins are collected, they obtain the status of hekdesh (sanctified for holy use) and may no longer be used for any profane use. After the year passes, the old coins can be used for other purposes, such as priestly garments or Temple utensils. Currently, American law forbids the shipment of these coins to Israel. To bypass the American prohibition, the transfer of the half-shekel is arranged via a personal emissary or by individuals who Prager has contacted to operate collection points in the US. Otzar Hamikdash has arranged for the silver coins – of which there are more than 200,000 – that have been collected to be stored by Brinks Security, which insures them for 125 percent of their value, taking into account the fifth that must be added to replace anything sanctified. By practically re-instituting the commandment, Prager has established the parameters determining how this commandment will be performed in the Third Temple. To ensure that his silver half-shekel qualifies, Prager raised the bar a tiny bit. The original shekel was 7 grams of 95 percent pure silver. Prager’s silver half-shekel is 7.776 grams of 99.9 percent pure silver. In this manner, Prager has established the criteria for the Third Temple era. The silver must be minted into a verified and recognizable coin so that the Temple does not have to evaluate the value of the silver. Silver is currently listed at $.48 per gram. “That is $70 million in silver annually,” Prager noted. “After the Third Temple is built there will be half-shekel vendors all over the country with safes for depositing the coins on the spot,” Prager conjectured. In Temple times, the nation began to give the half-shekel on the fifteenth day of the Hebrew month Adar at collection tables around the country. It falls on Friday, March 8 this year. On the 25th of the month, tables would be set up in Jerusalem for collecting the half-shekel. Prager’s commitment to this commandment was tested last year. After minting the silver half shekels, he checked the weight of the coins and found to his dismay that they were .75 grams under the required weight. “It was a great teaching moment,” he said. To rectify the mistake and ensure that each person could properly fulfill the commandment, Prager included a .75 gram sliver of silver with each coin. 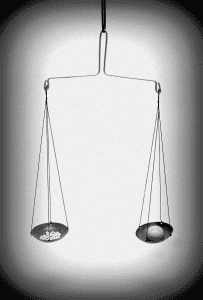 He compared this to the silver standard in which the standard economic unit of account is a fixed weight of silver. The U.S. took the final steps to abandon the silver standard in 1971. Prager also noted the spiritual implications of the silver half-shekel. To reflect this aspect of the coin, Prager established a fund to purchase silver half shekels for IDF soldiers which he personally distributes all over Israel. Prager explained that in Temple times, the coins were not dated according to the year but according to Jewish sovereignty in Israel. For this reason, his silver half-shekel is number 71 since it is currently the 71st year since the establishment of the State of Israel. The coin features the word “Sanhedrin” and an image of the semi-circular seating arrangement the Sanhedrin used in the Temple. Today, most Jews perform this commandment in a symbolic manner by giving charity, an approach the modern-day Levite turned tailor finds entirely unacceptable. As per this philosophy, Prager distributes techelet (blue threads for use in the fringes of four-cornered garments), Biblically styled clothing, and Biblical weddings. He also publishes a Biblically based calendar and has a selection of essential oils replicating the scents used in the temple incense. 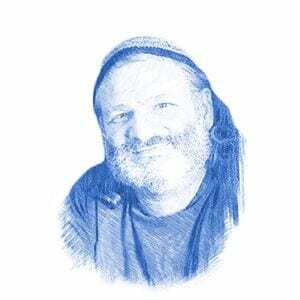 To purchase coins, contact Reuven Prager by email at begedivri@hotmail.com.